An international music festival for advanced pianists. “ … absolute surprise. One of the best pianists I ever heard. ” – Dmitri Bashkirov, after recital of M.Bulychev-Okser, July 2018. “…the great talent…” – David Dubal, the author of bestseller “Evenings with Horowitz”. Combining technical brilliance, musical passion, sensibility and special desire to explore new paths and contemporary music, Michael Bulychev-Okser is not only distinctive pianist, but also composer, devoted chamber music player, piano professor, producer and festival organizer. A protégé child, born in a family of prominent Moscow musicians, Michael began his first concert tour at the age 12 to the countries of Mediterranean: performing in Greece, Israel, Egypt and Turkey. Winner of international competitions in the United States, Italy, Spain, Mexico and Andorra, Bulychev-Okser received numerous Awards: for the Best Interpretation of Spanish music in Andorra, and for the Best Interpretation Special Award for his performance of “Feux Follets” by Franz Liszt. In 2009 he performed a series of 8 concerts in New York, featuring all 32 Beethoven’s Piano Sonatas. New York Radio Station – WQXR’s Robert Sherman featured Michael in a performance showcase of Khachaturian’s Piano Concerto in D flat. Since 2011, Michael Bulychev-Okser is an Honored Member of the American Society – Meet the Composer (New York). A recipient of “Who’s Who in Music” and “Outstanding People of the 20th century” among other awards, Bulychev-Okser gave recitals at the world’s most prominent stages: Carnegie Hall, Merkin Hall, Barge Music (New York), Kennedy Center (Washington D.C.), La Salle Pleyel (Paris, France), Wigmore Hall (London, United Kingdom), Heichal Hatarbut (Tel Aviv, Israel), The Saal Palace (Alexandria, Greece), IBK Concert Hall (Seoul, South Korea), The Rachmaninov Hall (Moscow, Russia) and Centermex Theater (Monterrey, Mexico). Michael’s orchestral engagements included performances with Manhattan Philharmonic, Sarah Lawrence Orchestra, Vienna International Orchestra (Austria), Parnassos Symphony (Mexico), and Rutgers University Symphony. An avid chamber musician, Bulychev-Okser collaborated with: Daniel Pollack, David Dubal, Dmitri Bashkirov, Min Kwon, David Dubal, Robert Lehrbaumer, Aleksander Buzlov, Albert Markov, Antonio di Cristofano, Sergej Stadler, Andreas Frolich, Oxana Yablonskaya, Kynan Johns, Anastasia Kozlova, Alissa Margulis, Borislav Strulev, Anna Shafajinskaja ( leading roles including MET, Concertgebouw, New Zealand etc. ), Olga Makarina (Metropolitan Opera), Denia Gavazzeni (Teatro alla Scala), Alla Aranovskaya and other notable musicians. Bulychev-Okser’s discography includes recording of Beethoven’s Pathetique Sonata, and Granados’s Goyeskas (RCA label). Bulychev-Okser’s recent solo album was released on Germany’s Neue Sterne Classical Artists Label, featuring Piano Transcriptions by various composers. Combining extensive performance activity with producing international events, Bulychev-Okser is a frequent Guest Artist, Piano Professor and Jury member at prestigious music festivals and competitions in the United States, Mexico, Spain, Italy, France, Switzerland, The Netherlands, Poland, Finland, Latvia, Estonia, China, Singapore, South Korea, Serbia, Ukraine, Israel, Greece, Egypt, and Georgia. As a teacher, starting from his 18th years old, he developed an unique own patented method, based on traditional art of piano playing and a new system in order to trigger inner imagination and to think in music interdependently, building a powerful creative intellect. The combination of this approach alongside with the art of Russian school of piano playing helped many young performers to gain prizes at international competitions worldwide. Bulychev-Okser is a Founder and Artistic Director of George Gershwin International Music Competition in New York, and Alion Baltic International Music Festival in Estonia-Latvia-Finland, the largest classical music festival in the Baltic Region with a mission of giving young musicians possibility to perform and gain new experience, learning from legendary masters. 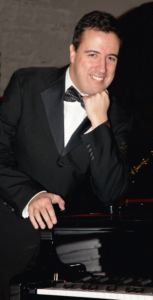 An alumnus of The Juilliard School, Michael Bulychev-Okser is a visiting Piano Professor at New York University. Recent engagements include solo recital at Carnegie Hall, concert tour in Italy, solo recital at the prestigious Chinese Cultural Center in Singapore, performances with Sankt-Peterburg and Alion Baltic string quartets, collaborating with Sergei Stadler, Anastasia Kozlova, Alissa Margulis, Alexander Buzlov among others.